SUMMARY: One person’s $55,000 appendectomy bill from Sutter Health systems in California is going viral on the Web. The surgery in question took place just before Sutter agreed to an out-of-court settlement over charges of false and misleading anesthesia billing. How much does an appendectomy cost? Well, that depends. We’re no longer that surprised by shocking hospital bills. 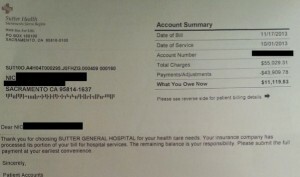 But people started talking on Twitter about this viral hospital bill on Imgur, the image sharing service. “So on October 1st of this year I woke up with an excruciating pain in my lower abdomen. Turns out it was appendicitis. So after about a 24 hour stay in the hospital I was free to go. This was the bill I received earlier this month,” wrote the poster, whose name is not on the bill. The two-hour recovery room stay of $7,501.00 raised special questions, and the anesthesia: $4,582.00! Sutter Health came to a settlement this November in a suit that it had overcharged for anesthesia. The chain, which runs 24 acute-care hospitals in California, agreed to pay $46 million in the out-of-court settlement, and also to give more pricing information to consumers, as the result of a whistleblower complaint charging that the chain’s billing practices were false and misleading. “Sutter Health, which runs 24 acute-care hospitals in Northern California, said it reached the settlement Monday just prior to a trial starting this month over the allegations that it added thousands of dollars for “Code 37x” anesthesia charges that were already covered by other billing for the hospital operating room,” Chad Terhune wrote in The Los Angeles Times. One of the most surprising pieces of this story came when the California hospital association head defended Sutter’s practices. “The state’s hospital trade group also defended Sutter and said its billing practices were in line with industry standards,” Terhune wrote. Which means: Sutter’s not alone. Here’s a blog post we wrote about this last year. But in this particular case, it seems obvious that the person should take the bill back to the Sutter billing office with a copy of Chad Terhune’s story. Scrutinize all hospital bills carefully. Some industry sources say 60 percent of hospital bills have an error; some say 100 percent of hospital bills have an error. Ask the hospital for an itemized bill with HCPCS or CPT codes, and insist that you need to confirm the accuracy of the bill before you’ll pay it. Look carefully at the insurance company’s explanation of benefits; compare it with the bill. Quite often an E.O.B. is also difficult to read. Question everything that seems unusual. If the bill shows something inaccurate, point that out to the billing office and ask for the charge to be removed. If the insurance company isn’t paying for something, ask them why and ask to see the point in the contract that allows them to refuse to pay. Calling both the provider (hospital) and payer (insurance company) will sometimes reveal that the entire bill is an error and you owe nothing. Don’t pay until you’re sure the bill is accurate. There are services that will argue your hospital bills for you. Some work for contingency fees; some are better than others. Do your homework if this is the path you choose. Get used to doing this. That $11,119.53 is a lot of money, and there’s much more of this coming.